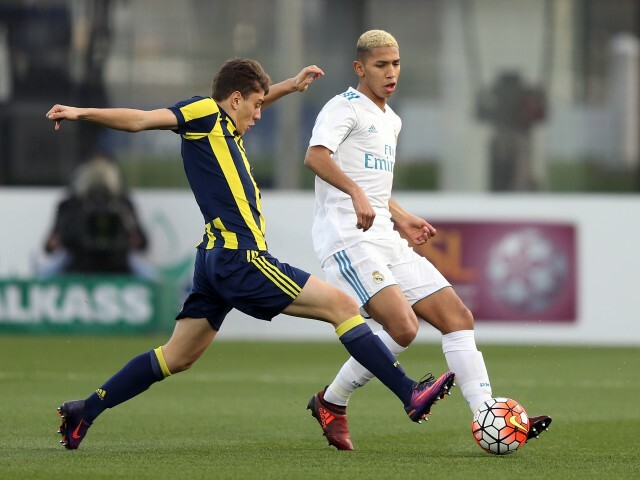 Before a capacity crowd including Qatari Ministers, VIPs, dignitaries and hundreds of excited fans, Real Madrid and Fenerbahçe got the seventh Al Kass International Cup underway in thrilling fashion, with the young Spaniards cruising to a 6-2 victory over their determined Turkish counterparts. Dutch footballing legend Wesley Schneijder – recently signed by Al Gharafa to compete in the QNB Stars League – got things underway by performing the ceremonial kick-off. Real took some time to recover from this early setback, but gradually began to show their class. Jorge Martin Camunas was starting to look dangerous with some powerful runs down the inside left channel, and he earned a free kick 15 minutes in. Alvaro de Frias floated the ball into the area but unmarked centre back Sergio Santos, with the goal at his mercy, could not connect. Fenerbahçe captain Emre Nasuh had a chance to level matters 10 minutes before the break, when he stole the ball and attempted an audacious lob that caught the stiff breeze and sailed over the bar, much to the relief of stranded Madrid stopper Adrian Moya. Within minutes, Nasuh would have cause to rue his missed opportunity. Madrid number 10 de Frias conjured some skilful footwork on the edge of the Fenerbahçe area before picking his spot and expertly curling a low effort into the left corner. Determined to go one better than his previous effort, Nasuh almost beat Moya with a rising drive from distance that only just cleared the bar. It was the last meaningful action of the half – one that suggested that Fenerbahçe were still in the game, despite being 3-1 down. However, the deficit increased soon after the restart after substitute Jorge Ramirez powered forward and fed di Frias, who was brought down in the area, leaving referee Moatassim Ahamed little option but to point to the spot. Tunc produced a fine save, low to his right, from Carlos Gonzalez’ spot kick, but the Real number 8 made no mistake from the rebound. For the remaining half hour, it was a case of damage limitation for Fenerbahçe, as Madrid remained on cruise control. There was still time for a consolation goal, with Turkish number 15 Omer Beyaz converting from the spot in added time to make the final score 6-2. The Spanish side have set a gold standard at Al Kass 2018, and can rightly be considered among the tournament favourites even at this early stage. And yet, despite the one-sided scoreline, the Turkish team showed enough on their tournament debut to suggest that they may come back strongly as the competition progresses.